We’re excited to introduce the new DrapeStyle Luxe Collection for 2014. 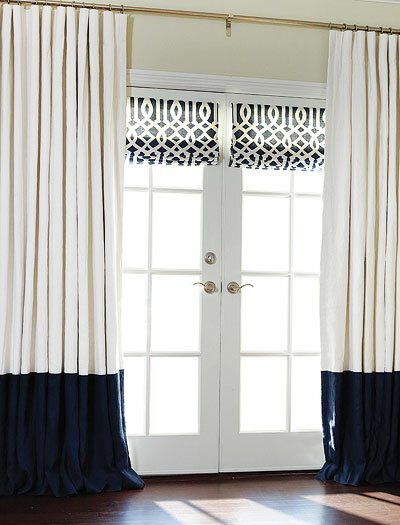 These contemporary drapes are available in 25 amazing fabrics including the Parker which features the Nautical Knot Embroidery. Our Luxe Collection is available in any of our pleat styles including French Pleat, Cartridge Pleat and Grommets. These fabrics are in short supply so order your samples as soon as possible! Most of the Luxe collection is comprised of Linen / Poly Blends or 100% Polyester which is wrinkle resistant and durable. You can get an extra long drapery panel at 135 Inches long and 46 inches wide, lined and interlined in the Parker Sapphire as shown below, for under $500 per panel. Once again DrapeStyle is proving that you can get high-end luxurious custom drapes without over-paying! These prices are valid until May 9th. The Luxe Collection by DrapeStyle shown in Parker Sapphire with Parisian Pleat. Our designers are often asked to explain the difference between the different types of Silk Drapery Fabrics we offer at DrapeStyle. The three primary categories of Silk are Dupioni, Taffeta and Hand-Woven, also known as Matka. All of our Silks are imported from India however, there are distinct characteristics that make each one unique. Silk Dupioni is known in the textile industry for its modest sheen and less refined texture. The natural texture and slubs in the Dupioni yarn give it a slightly less formal look, which makes it a timeless choice for any Decor. Silk Taffeta is considered a more formal and luxurious fabric due to its higher sheen and more refined weave. 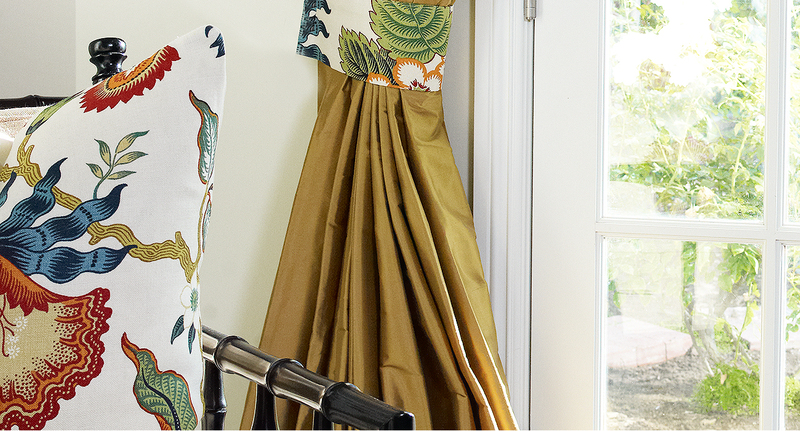 Our Taffeta has a crisp smooth finish that looks elegant in any pleat style. DrapeStyle’ s European influenced, 100% Hand-Woven Silk Collection is the new look of Silk. We like to describe it as a marriage between the elegance of Silk and the natural texture of Linen. This combination gives it a unique, heavy weight weave often used in transitional designs. In any length, width or pleat style, this updated material has quickly become one of our best sellers. The Weave of Silk Matka makes the fabric perfect for extra long drapes and Roman Shades. Silk Matka is resistant to stretching, if you need longer drapes like 125 inch custom drapes, 126 inch custom drapes, 127 inch custom drapes or even longer than Matka may be a good option for you. Call one of our Designers and let us help you determine your perfect length, width and pleat style. Sometimes I look through our old photo-shoot files and find some images that I honestly had forgotten that we even had. So, I thought it would be a good idea to get those photos out to the public. This edition will be limited to silk drapery images and I’ll post photos of our Linen Drapes, Velvet Drapes and the rest of our photos in later posts. I’ll try to give you some perspective of where each photo was taken and some of the background of each as well. I hope you enjoy. Well, I guess the best place to begin is…the beginning. This is the very first photo of a silk drapery panel that we ever took. Back in 2006, when we took this photo, we used to shoot on large-format 35mm film. finally had a “digital” photo that we could use for our young website. The photographer who took this photo went on to take photos for us for over 10 years. 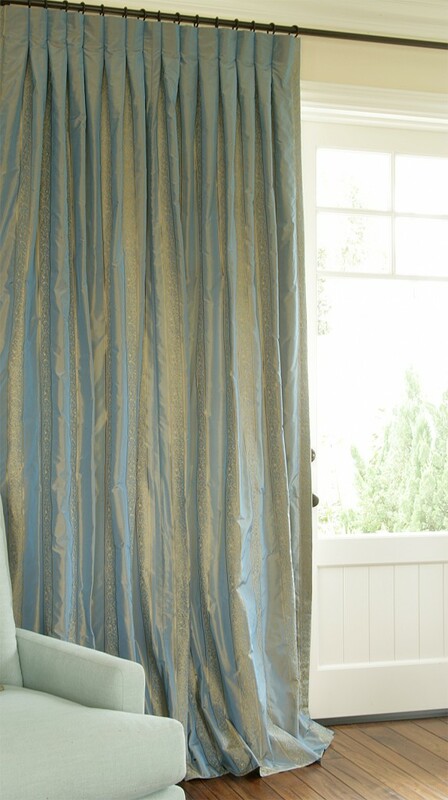 These drapes are Sea Blue Dupioni with French Pleat. blocked the flash from being seen through the panel. Same photo-shoot. 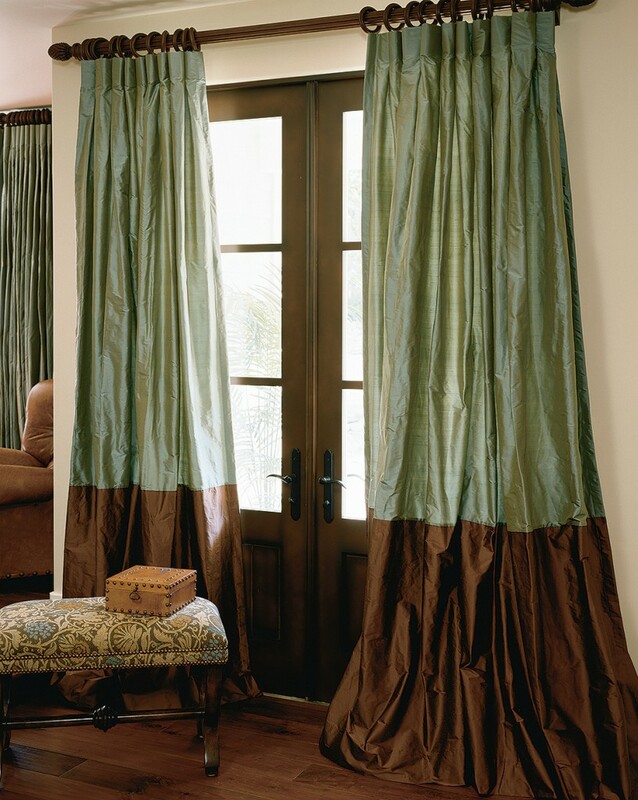 Chocolate silk dupioni drapes with a now vintage tie-back in Schumacher Fabric. One of the many things that I love about our Business is being fortunate enough to have amazing Clients who invite us into their homes to photograph the drapes that we have made for them. We have never paid for a photo-shoot location. 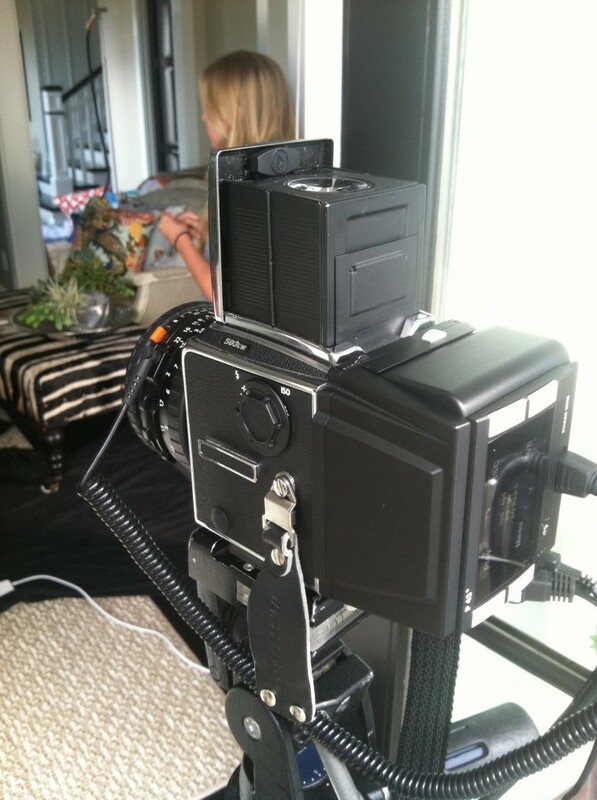 Almost every shoot that we have had (and we have had many) are shot in the home of one of our Clients. No “Sets” nothing is fake. Just great Clients who have welcomed us into their amazing homes. When we started DrapeStyle one of our most popular fabrics was Embroidered Silk. We made some amazing drapes in these fabrics that we import directly from India. Over the years the price of these fabrics has increased by about 5 times what we used to pay for them in the early 2000’s which has made them really expensive. weaving run profitable for them. New Photo-Shoot, New House. Embroidered Silk Drapes with Inverted Pleat. This is a simple single-width rod-pocket Embroidered Silk Drape. We added a 2″ Flange to the top of the Rod-Pocket. Here is a similar Rod-Pocket Single-Width Panel without the 2″ Flange. These are typically used as “side-panels” and would be decorative as opposed to functional drapes. warm and “homey” photo. One of the things that I do notice when looking at these older shots that were taken on film is that they do seem to be richer and warmer in tone. any silk at all are just making solids. Very few mills are even making simple stripes that used to be so popular. We loved these wide soft stripes that were very subtle. These were gorgeous drapes. One of our popular Bordered Silk Drapes in Salaam Green and Chocolate. We split the length into thirds. The top-color goes on the top two-thirds of the panel and the border fabric comprises the balance. Linen on the bottom or vice versa. Don’t be afraid to take some fashion risks! 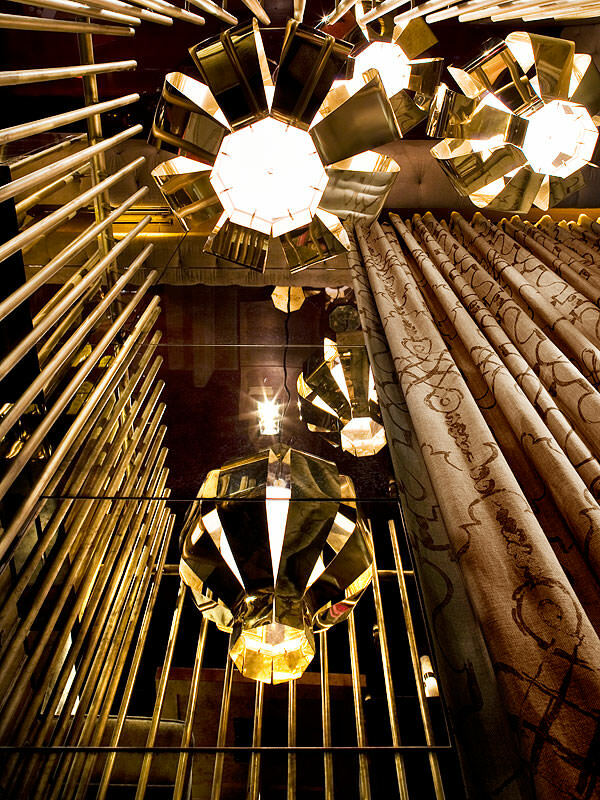 Our Designers can help design an amazing set of draperies for you! 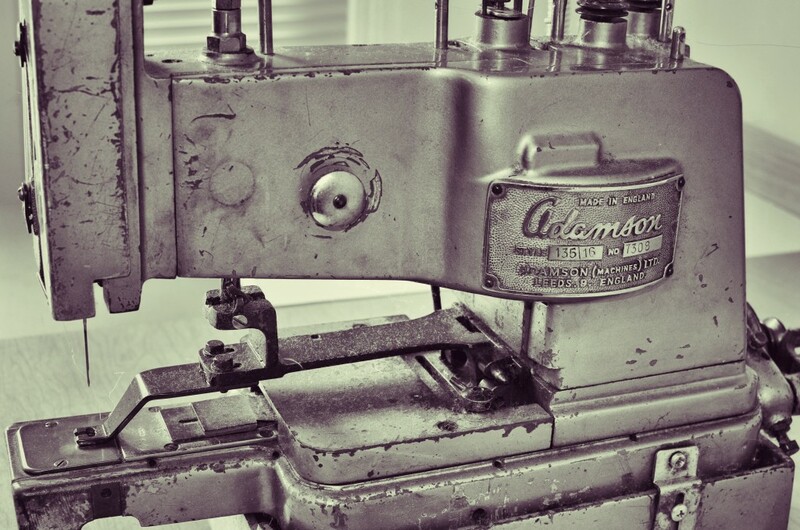 Schumacher has always been one of our favorite Fabric Mills. We’ve been making drapes, Roman Shades and Pillows out of their fabrics forever. This Hot House Flowers Fabric was a true classic! We can make Tie-Backs in any of our fabrics, just give us a call to order over the phone. The French Pleat is one of the most popular pleats we make. Really, the French Pleat has been a popular pleat for hundreds of years. So, if we can make some great Bordered Drapes, we can certainly make Double-Bordered Drapes, so, we did! If one border is good, Isn’t two borders even better? Here are a couple of fun photos of us taking photos! 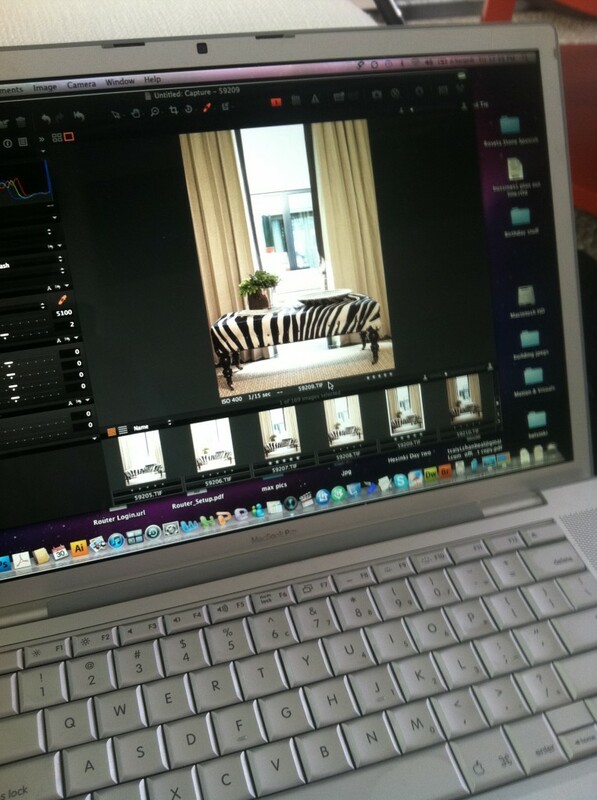 Editing some of our photos on while we shoot. 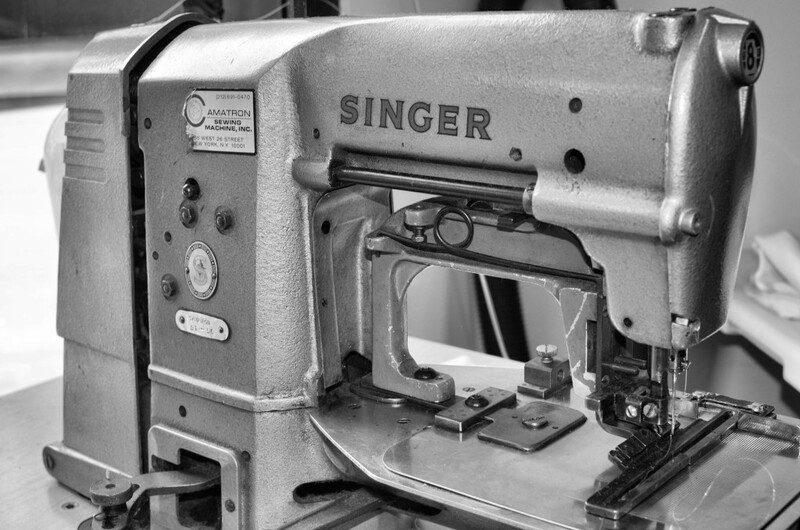 I know that we “say it” all of the time, but it really is amazing to see how talented our Team of Seamstresses are. They make hundreds of custom drapery panels every month and they make each one by hand. 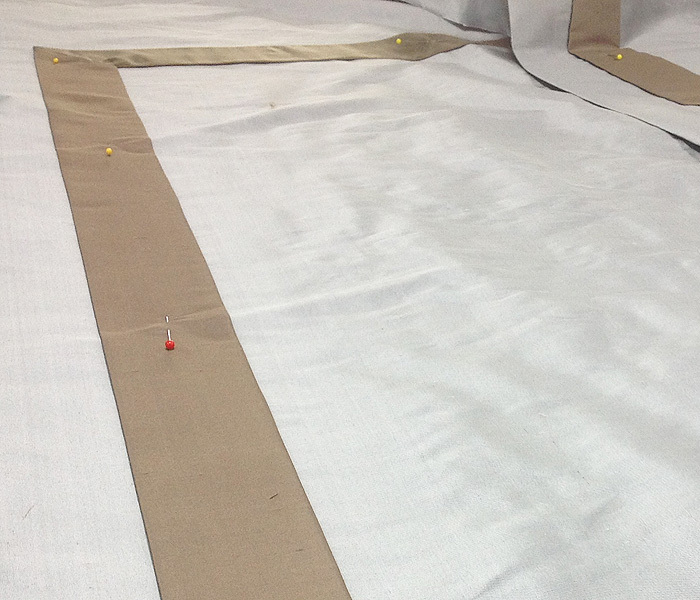 Our Silk Hotel Drape is one of Decorators favorite styles and we love to watch them being made. Our Seamstresses start by “Tabling” the drape, which means that they roll the fabric out onto a table and hand cut the the silk fabric to the correct length and width. Once the drapery fabrics are rolled out and cut, our Seamstresses will then have to cut the trim fabric that distinguishes the Hotel Drape. They cut yards of silk fabric into long strips…by hand. They then lay the strips of fabric onto the drapery fabric and pin it, by hand every few inches. They do this all the way around the perimeter of the drapery panel. Once they are satisfied with the position of the trim they will tack it down with a small amount of special fabric glue. The glue will hold the trim in place so that it can move through the sewing machines without moving. 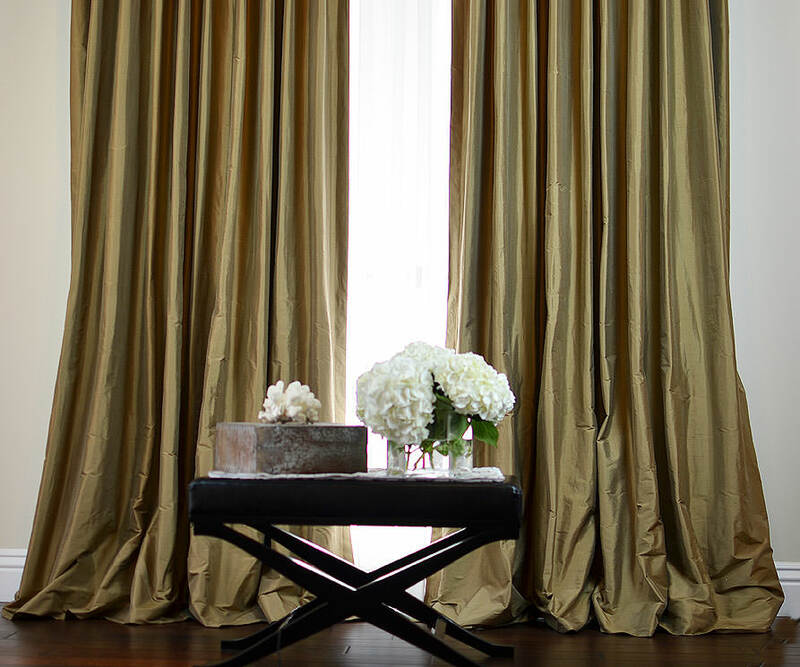 It takes us about 6-7 hours to make 1 pair of Silk Hotel Drapes or Linen Hotel Drapes. I know that they cost a little more than our standard silk or linen drapes but if you came and watched your draperies being made by these wonderful Seamstresses I promise you that you would think that they are a “bargain”. I know that today with all of our technology and almost everything that we have in our homes being imported from China it is hard to believe that there are still amazing and wonderful People who are making Products right here in America. 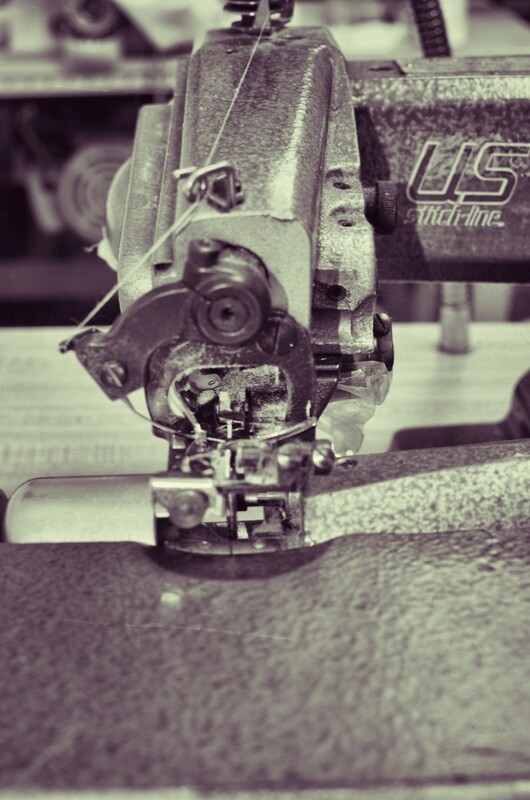 At DrapeStyle we are all truly honored to be part of American Craftsmanship and Manufacturing. We really, really hope that you enjoy your DrapeStyle Drapes. 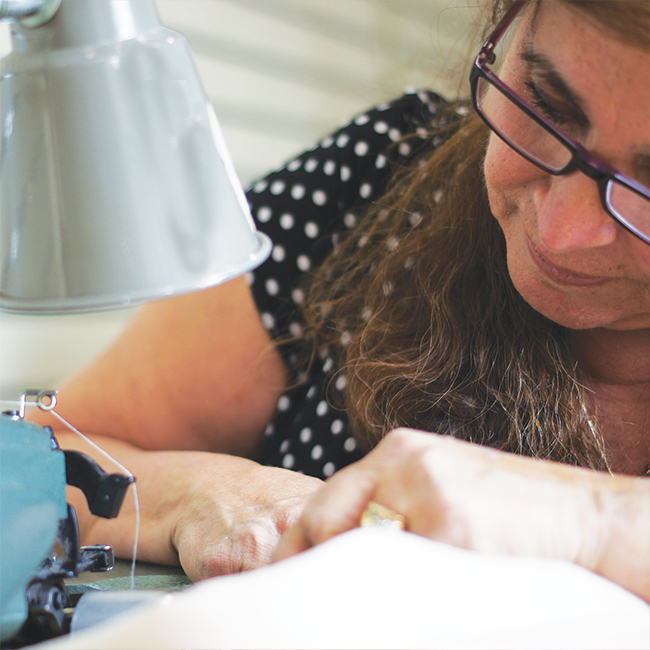 One of our Amazing Seamstresses at work. One of Our Amazing Seamstresses. 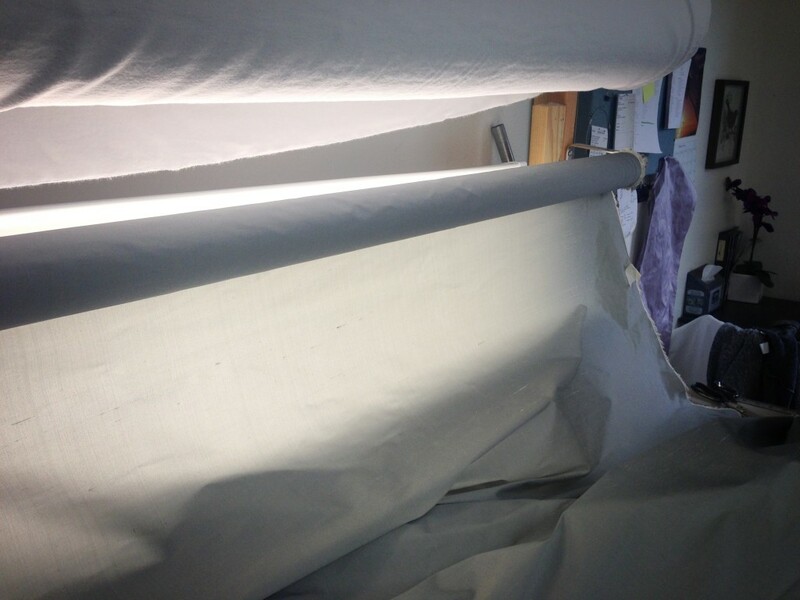 More goes into making a high-quality Custom Silk Drape than you may think. Here are some of the quality construction elements of why our custom silk drapes have been Designers favorites for over a decade. These are the drapes that House and Garden Called “Beautifully Made to Order”. A: 100% Brass Grommets: Grommets are one of the most popular Pleat Styles for Silk Drapes. At DrapeStyle, we only use high-quality 100% Brass Grommets on all of our drapery. Brass Grommets will resist corrosion and will not discolor the drapery fabric. Our Grommets are also powder-coated (when a color is selected) which is much more resistant to peeling and chipping than paint. Finally, we hand-press each Grommet into the drapery panel. Hand-Pressing helps us to protect our fabrics from pulls, tears and “puckering” that are very common with “machine-pressed” Grommets. 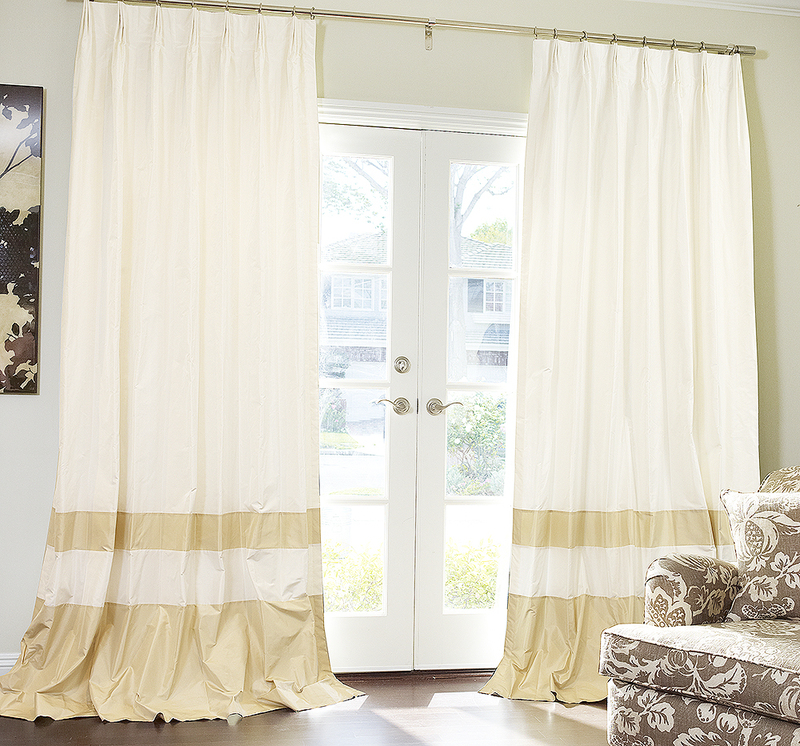 B: 1-1/2 Inch Double Side-Hems: At DrapeStyle, all of our drapes are made with Double Side-Hems. Double Side-Hems really define “Custom” are are typically never seen in “store-bought” drapery. When making our side hems we use double the material, including linings and interlinings to create a very thick and heavy edge for the drapery panel. Making double side-hems uses twice the fabric than single side-hems but are one of the defining characteristics of High Quality Custom Silk Drapes. C: 100% Indian Silk: We import all of our Silk Fabrics directly from India, many of which, are exclusive to DrapeStyle. India is the indisputable leader in weaving premium Silk Fabrics used in textiles worldwide. In fact, India has been weaving silk fabrics for literally thousands of years. At DrapeStyle we use Indian Silk exclusively, and never use lower quality (although cheaper) Thai Silk or any other inferior silk fabrics. Before we make your drapes we inspect the fabric by unrolling it in front of a back-light which shines through the material showing the fabrics flaws. Unacceptable flaws in the fabrics are rejected. 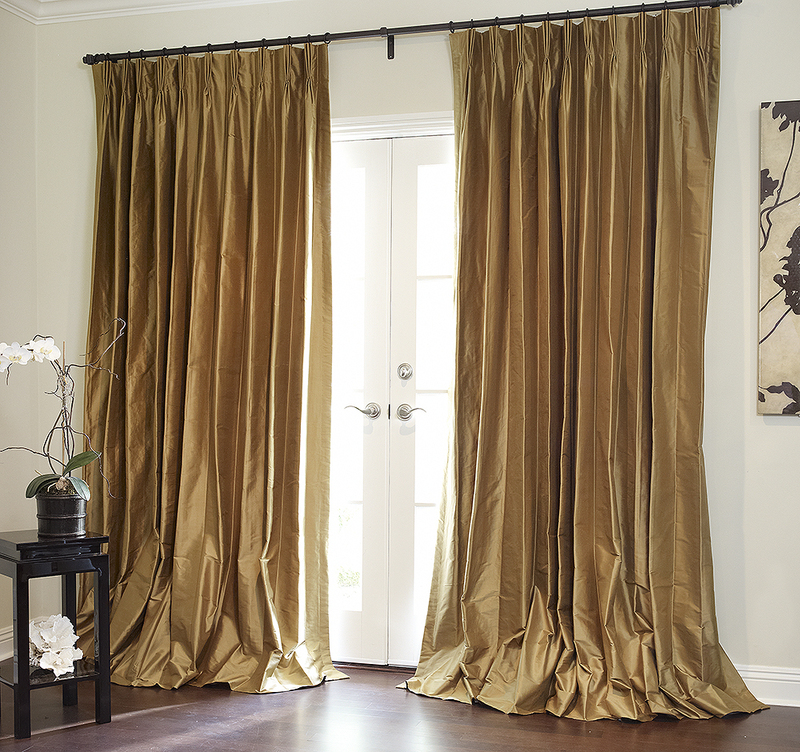 D: 4″ Double Bottom-Hem: Like our Double Side-Hems, we also use a 4″ Double Bottom-Hem on all of our silk drapes. Using a double-thick Bottom-Hem gives the drapery panel more fullness and allows it to “puddle” on the floor with more weight and thickness. Interior Designers and Decorators who know custom drapes would never specify anything other than a Double Bottom Hem. E: Bottom Weights: We sew-in steel weights to the bottom corners of all of our custom silk drapes unless instructed otherwise. These weights are unique to “custom drapes” and are absolutely critical to the appearance of a well-made drape. The bottom-weights make the drapery panel hang straight and uniform and keep them from blowing in the slightest breeze. If you want “lighter” drapes that will blow more easily in the wind you can ask that we do not install the bottom weights. 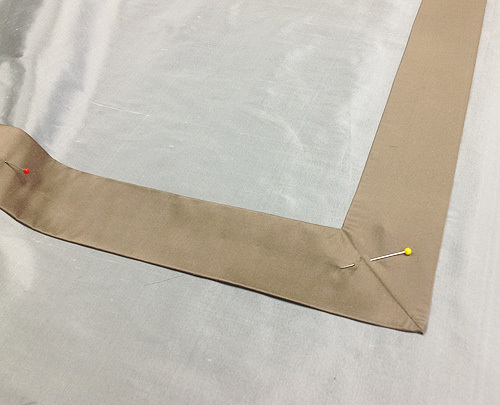 When it comes to custom drapery with grommets there are dozens of options to choose from. The most important thing to consider what the drapery application will be, meaning, are you going to be opening and closing the drapes often? Are they going going to be custom outdoor drapes? 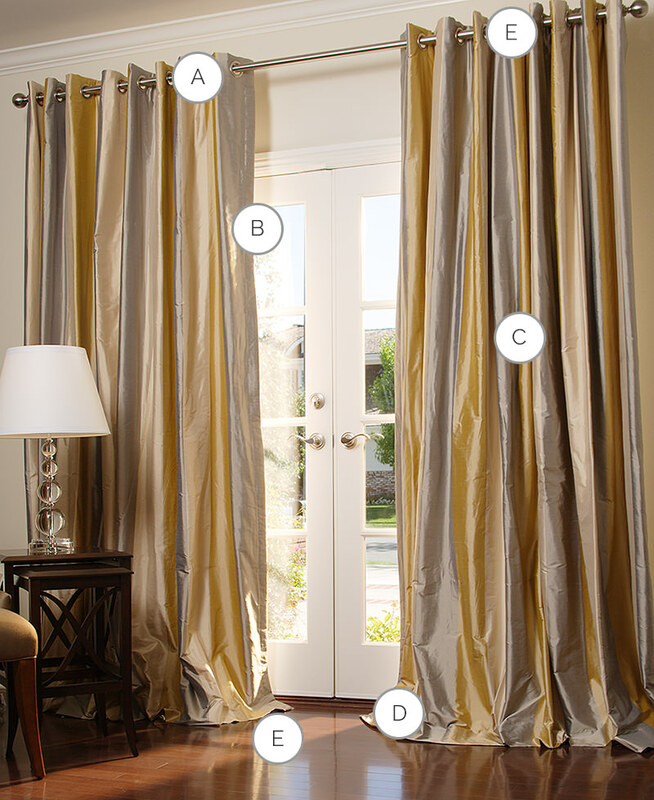 The answers to these questions will help you determine which is the right choice is grommets for your drapes. Of course, you style will also play a large role in your decision making process. If your drapes are going to be opened and closed often you will want to be sure that the size of your grommets are large enough to easily slide over your pole. You will also want to get a drapery wand so that you are not having to “pull” on the drapery fabric, especially if that fabric is silk or linen. If your drapes are going to be used outdoors you will want to be sure that the grommets are made of 100% Brass which will resist decay from the environment. You will also want to be sure that the grommets are weatherized and powder-coated vs. painted. If your grommets are painted they will chip and peel in a short amount of time. Grommets are a great option for almost all fabrics for drapery including Sheers, Linen, Silk and Cottons. When selecting silk you will want to be sure that the grommets are “hand-set” using a manual press, an automated press will generally make the fabric pucker and warp. Let’s Exchange Curtain Ideas Birmingham Alabama! If you are looking for custom drapery in Birmingham Alabama you should be contacting DrapeStyle. DrapeStyle has been assisting customers worldwide, throughout the US and Canada, in creating custom drapes for over ten years. Our staff of experienced interior designers and drapery experts are waiting to assist you in creating the best solutions to treat your windows. Do you have tall two story windows and need extra long drapes? 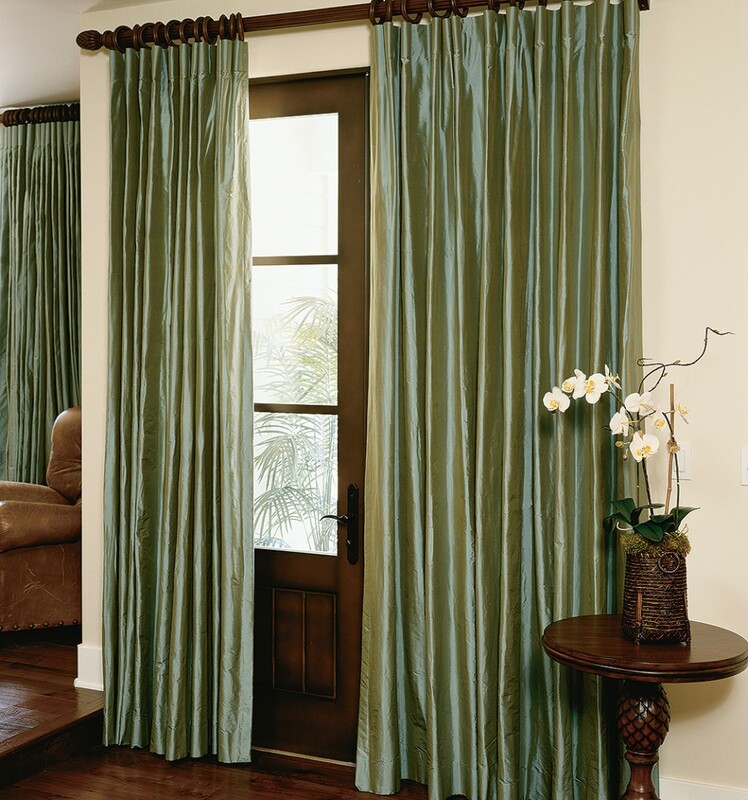 Do you have a wall to wall sliding door and need extra wide drapes? No matter what kind of tricky window you may have, we have you covered! 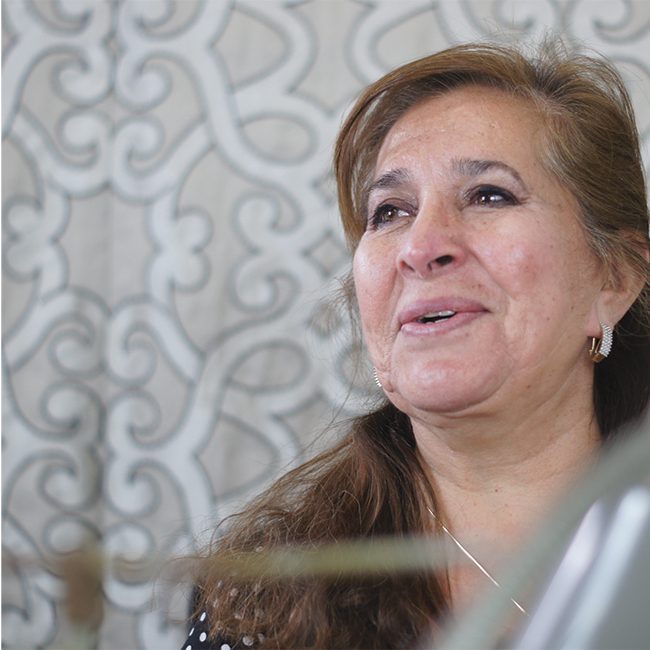 Our custom drapery consultants are here to help and walk you through the process. Confused about pleat styles? Unsure of color choice? Concerned about taking measurements? Let us take out the guess work from your project. Simply give us a call. Don’t let your zipcode dictate where you shop. 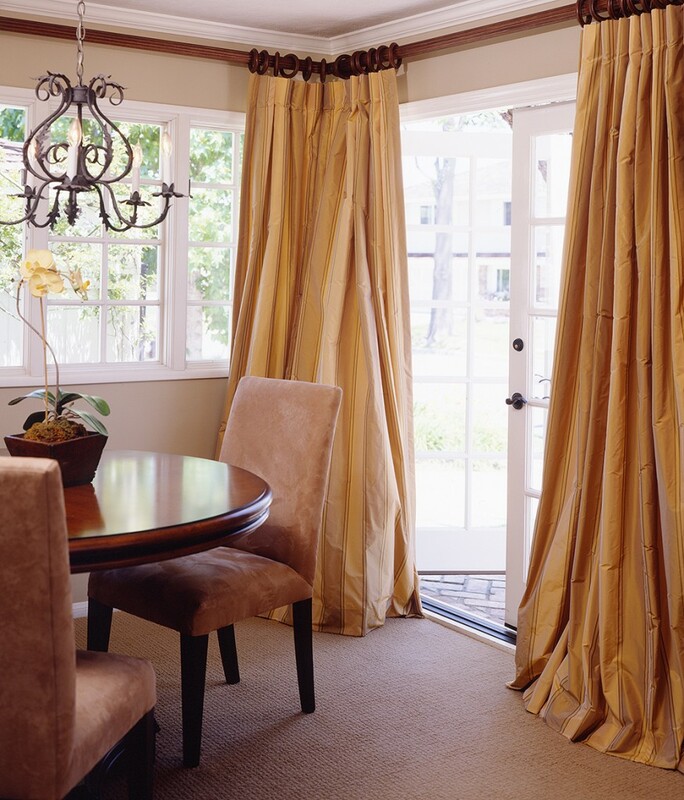 Whether you live in Birmingham Alabama or Scarsdale New York, you can own beautiful custom drapes hand stitched in our Orange County California drapery workroom. Let’s talk curtains and exchange ideas today! It seems that almost all of the new homes that are being built lately feature huge, extra long and panoramic windows. These windows are dramatic and provide amazing views but can be somewhat of a challenge when it comes to buying custom curtains or drapes. If you visit most of the typical Retailers like Restoration Hardware or Ethan Allen you are probably not going to find drapery that will cover extra long windows. Most retailers won’t have drapes that go beyond 120 inches. At DrapeStyle we make each drapery panel to order and we can literally make any length or width you can imagine. We “specialize” in “custom”. Nothing is ready-made and we seriously don’t have any templates or restrictions, and we can ship your drapes, no matter how long or wide they are to almost anywhere on the planet. We’ve made extra long drapes for Clients as far away as Australia, and, I don’t think you can get much further away from Orange County, California than Australia. We can make longer curtains for Homeowners, Churches, Hotels, Restaurants and really any location. Here are a couple of photos of extra long drapes we made here at DrapeStyle. Oh, and we can also arrange to have your extra long or wide drapes installed as well! 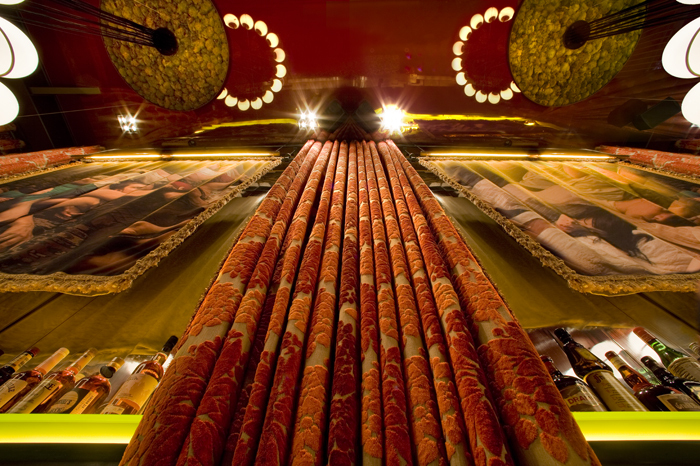 We made these extra long drapes for a restaurant in San Francisco. They were over 25 feet long. Here is another angle of the same really, really long drapes. 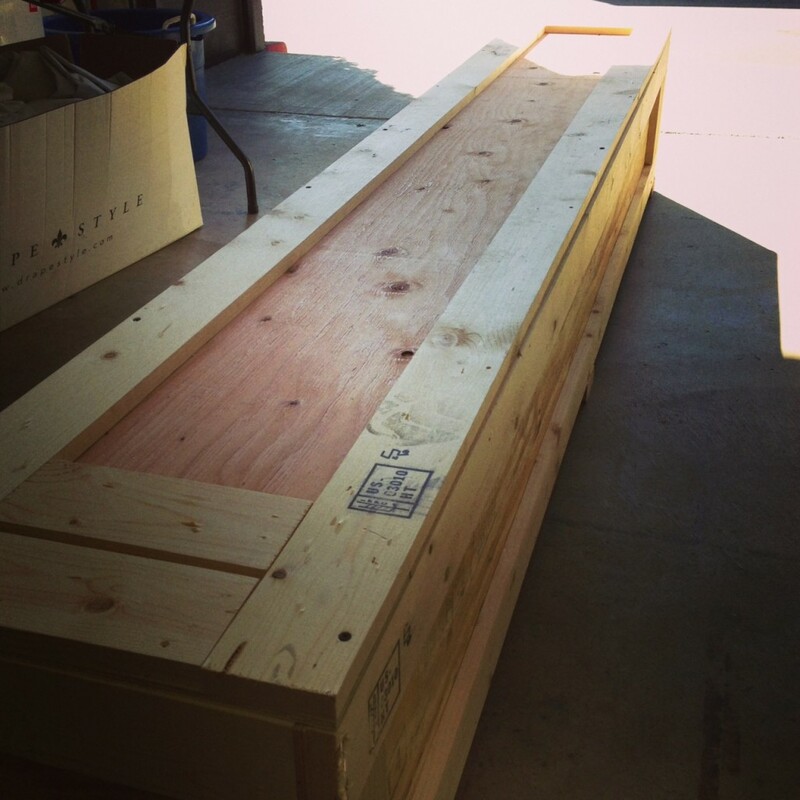 We can ship your extra, extra long drapes to almost anywhere on the planet. Here are a set of drapes that were 240 inches long going to a Customer in Australia! 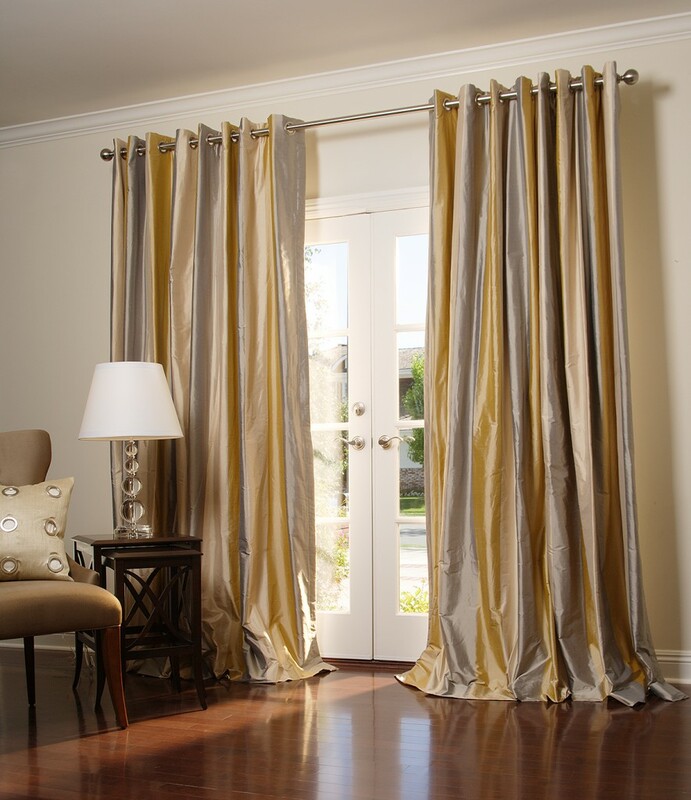 At DrapeStyle we LOVE Extra Long Curtains and Drapes! 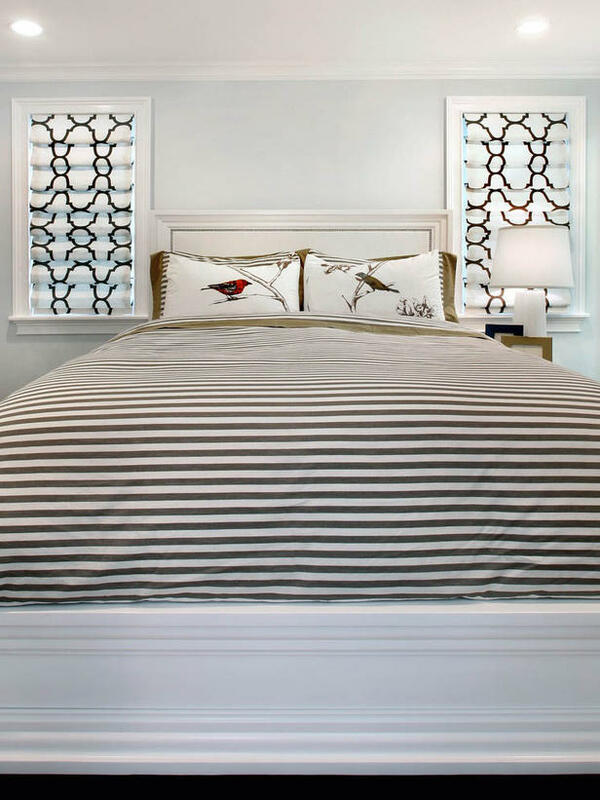 We love these Roman Shades in Gate White /Black. Roman Shades can be very contemporary and don’t need to be expensive! We have some great options that start under $250 per shade which includes linings. 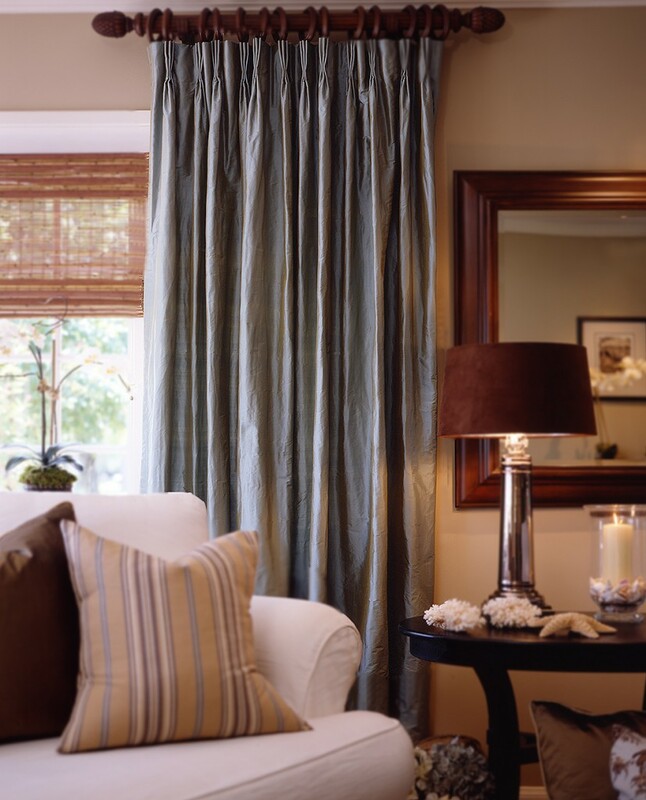 You can also experiment with layering silk drapes over Roman Shades for added depth, contrast and texture. Love These Contemporary Roman Shades in Black and White! 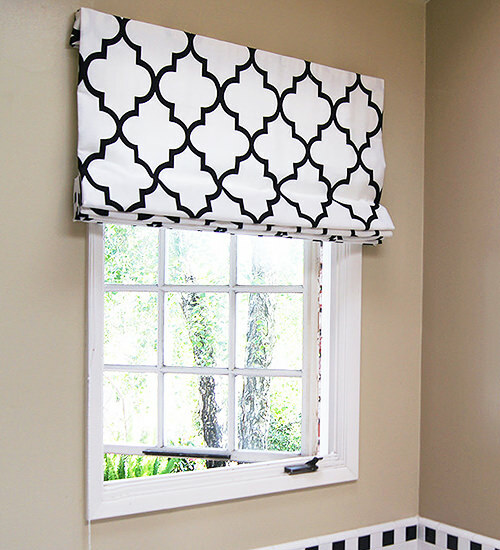 Flat Roman Shade in Gate Black / White by DrapeStyle. 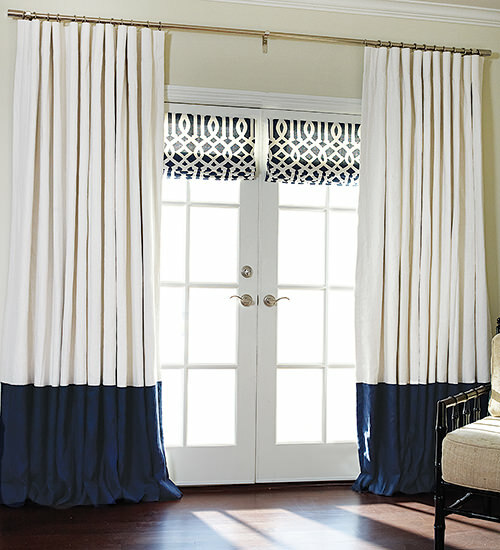 Combining Drapes and Roman Shades, or even Shutters is a great way to add more depth and interest to a window or door. You can specify that the Roman Shades be “decorative” which will help stretch your budget. 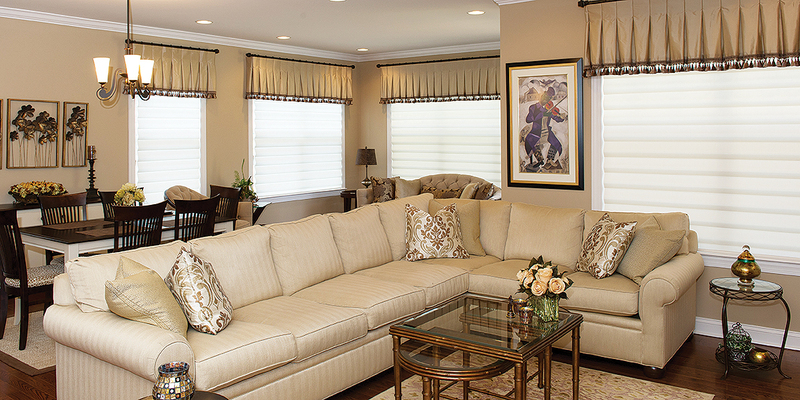 Call one of our Designers, we would love to give you some ideas on how to add Roman Shades to your Home! At DrapeStyle we make a LOT of custom silk drapes. Been making them for well over a decade and shipping them all over the US and Canada. Most people know that silk is a natural fabric that is woven from the raw silk produced by the Silk Worm. Most raw silk is harvested in China and then chipped to India where it is woven into Silk Fabric and shipped all over the world. India has been the predominant producer of silk fabrics for literally hundreds of years. Our silk fabrics arrive from India on rolls that average about 40-45 yards each. They are all 54 inches wide. The first thing that we do when we are preparing to make a set of silk drapes from our fabrics is to roll the fabric out against a light. We do this to look for imperfections in the silk fabric before we make any draperies from it. As a natural silk, most people know that it is going to have natural flaws or imperfections, especially Dupioni Silk. At DrapeStyle we have set “standards” of what we allow to pass and what we reject. When we find flaws that we reject we have to cut the entire length of fabric to remove the flawed area. Silk is expensive and having to cut portions of fabric out of roll and discard them hurts our profit margins. It’s not the way other Manufacturers do it but we think that it is the right thing to do. If you are thinking custom drapes in Atlanta you should be thinking DrapeStyle. DrapeStyle has been manufacturing premium custom silk drapes, linen drapes and Roman Shades and shipping them to Atlanta for the past decade. We are happy to provide you with free samples of some of the most exclusive fabrics from Mills like Schumacher, Robert Allen, Kravet and Beacon Hill. Plus we have exclusive DrapeStyle Silks and Linens that will compliment any decor. 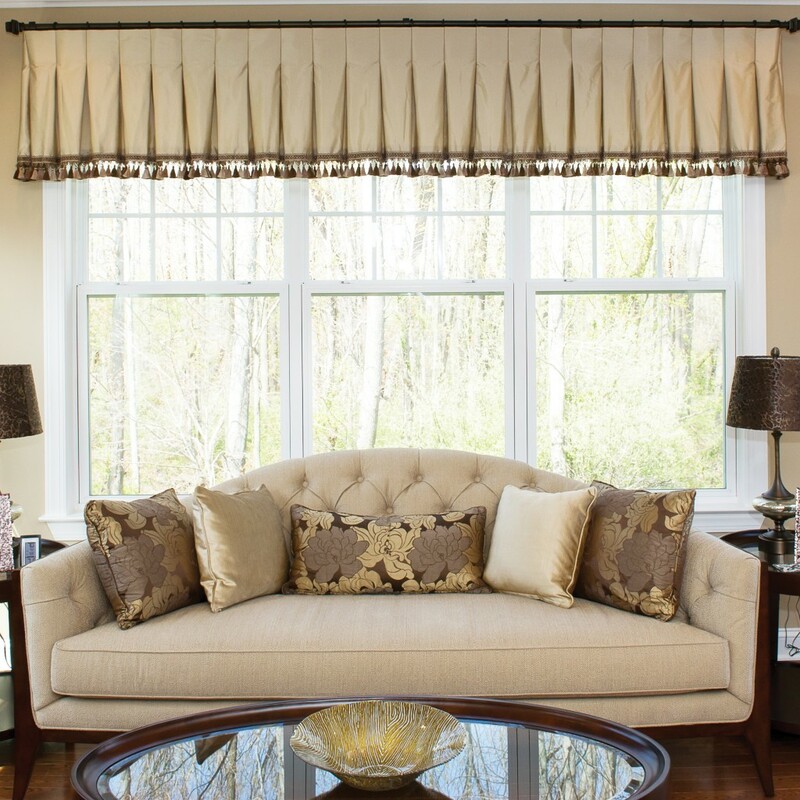 If you have tall windows and need extra long drapes or extra wide drapes, we have you covered. 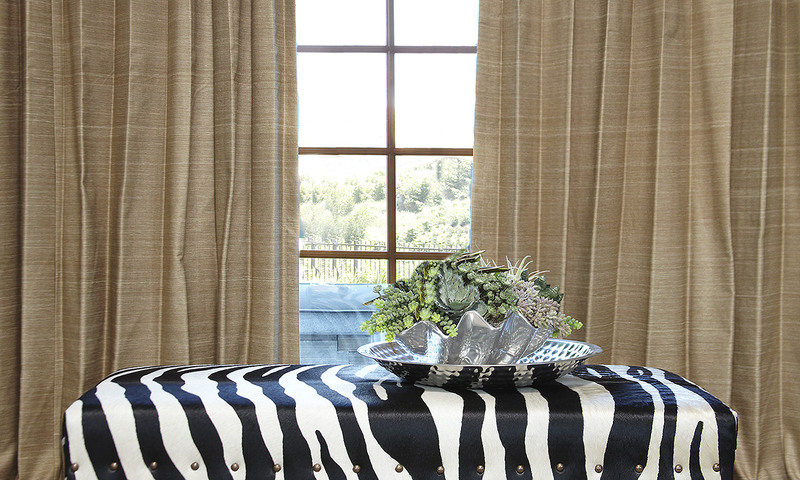 We manufacture each of our drapes and Roman Shades to order in our California Workroom. Call one of our Designers and let us show you how easy it is to Exchange your Curtains for amazing DrapeStyle quality for a price that will wonder why you waited so long. Linen has been one of our most popular fabrics for over a decade. 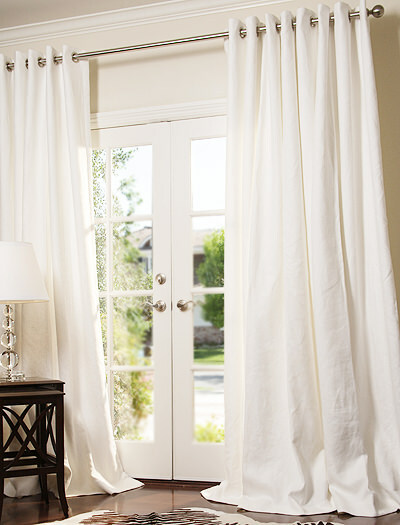 We offer a few varieties of Linens all of which make classic and luxurious custom drapes. Which is the right Linen Fabric for you drapes and you home? Let’s first discuss a little about what linen is, how it is made and little history of this fabric. Linen is actually harvested from the Flax Plant and dates back to ancient Egypt as early as the 4th Century BC. Originally Flax was boiled and woven into Linen fabric which was used extensively for tunics, gowns and even wrapping of the bodies of the deceased. Later when the milling and production processes improved so that Linen could be woven into longer lengths it was used to create decorative draperies for the Ancient Kings and Pharaohs. When King Tut’s Tomb was discovered and opened, they found linen drapes still hanging where they had been for centuries. Later Linen production moved to Europe where the process was further improved and the fabrics were used for clothing, upholstery and even for the insulation of homes. Linen is a great choice for custom drapery and Roman Shades as it is heavy, well-insulating and comes in a wide variety of gorgeous colors. It is also typically, more economical for drapery when compared to other types of fabrics like silk. At DrapeStyle we offer a few varieties of Linen for our drapery. Our Classic Linen is a well-made heavy-weight Linen that is imported form Europe. We love to create different drapery styles with Linen such as our Bordered Linen, Banded Linen and Hotel Drape in Linen. Our Classic Linen is available in a variety of solid colors. Our Patterned Linen is the some Linen Fabric as our Solid Classic Linen and comes in both traditional and contemporary patterns including the popular Ikat and Chevron Patterns. Our Estate Linen is a heavier weight and softer woven linen that makes incredible custom drapes. Our Estate Linen is also known as Bristol Linen and it has a much wider and looser weave. I would suggest ordering samples of both the Classic Linen and the Estate Linen and you can easily see the difference in the weave of the fabrics. This year we introduced our Manhattan Linen Collection. Our Manhattan Linens are a blend of Linen and Polyester and make amazing drapes. The primary benefit of blending some Polyester into the Linen Weave is to reduce the amount of wrinkle that you will get from 100% Linen. If we get any comments and concerns about Linen it is that it wrinkles easily and will usually need to be steamed to release the wrinkles. The blending of the Polyester significantly reduces the amount of wrinkles and also makes it much easier to remove any wrinkles that may exist. Finally we offer our Sheer Linen Collection. Like the name implies, our Sheer Linens are extremely lightweight (they can easily be seen through) and are very similar to gauze in weave and texture. 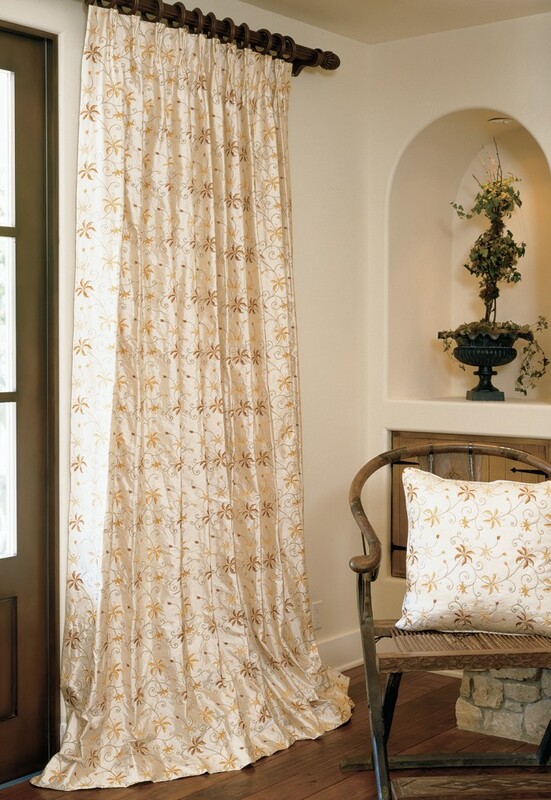 Our Sheer Linens are the perfect fabrics for those casual bungalow drapery panels. When you think of Sheer Linens just think of Coastal Living Magazine, relaxed and casual. Please feel free to call one of our Designers to answer any questions that you may have about our linen fabrics and custom linen drapes. One of the latest trends that we are seeing with custom drapes and window treatments is the layering of multiple treatments in one window. 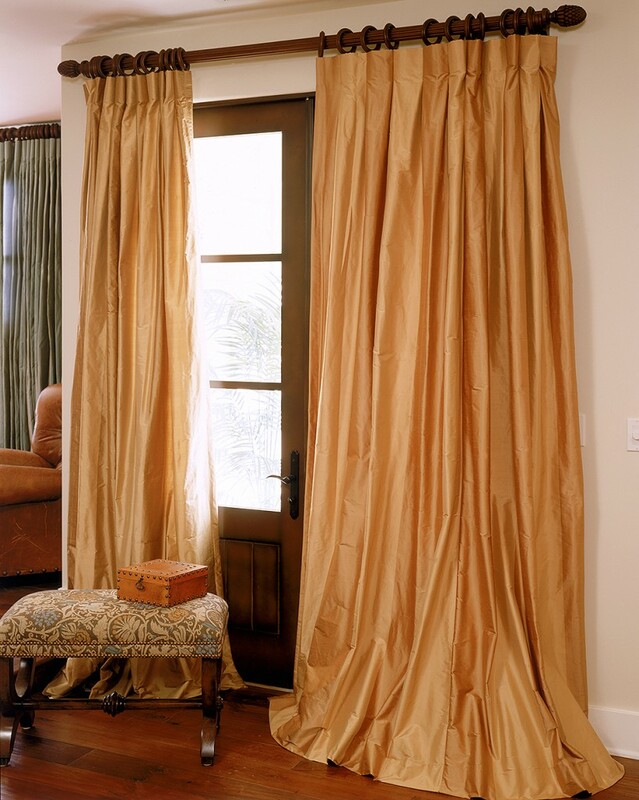 for years we have layered sheers under drapes using a traverse or double rod. Today we are seeing more drapery layered over Roman Shades. We are also seeing drapery layered over hard wood shutters. The layering of treatments has been a Designers secret for years. By layering drapes and Roman Shades you are creating more depth and texture on the window or door which also allows you to work with different fabric types and patterns. 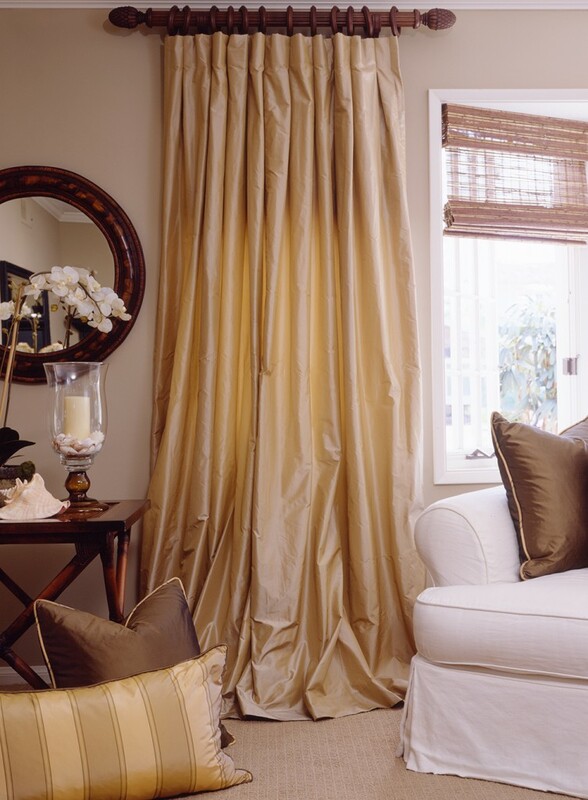 As an example you can choose a classic solid linen or silk drape with a bolder patterned fabric on the Roman Shade. You may think that this method may be more expensive than a single treatment on the window but here is what Designers would suggest; If you are going to use drapery in conjunction with a Roman Shade you can spend less on the drapery fabric and than spend more on the Roman Shade Fabric. Make the Roman Shades “Decorative” vs. “Functional” and you will need much less fabric on the Roman Shade and still get the “pop” of an expensive designer fabric. In the attached example we use a relatively inexpensive solid linen for the drapery fabric and then used a Schumacher Fabric for the Roman Shades. 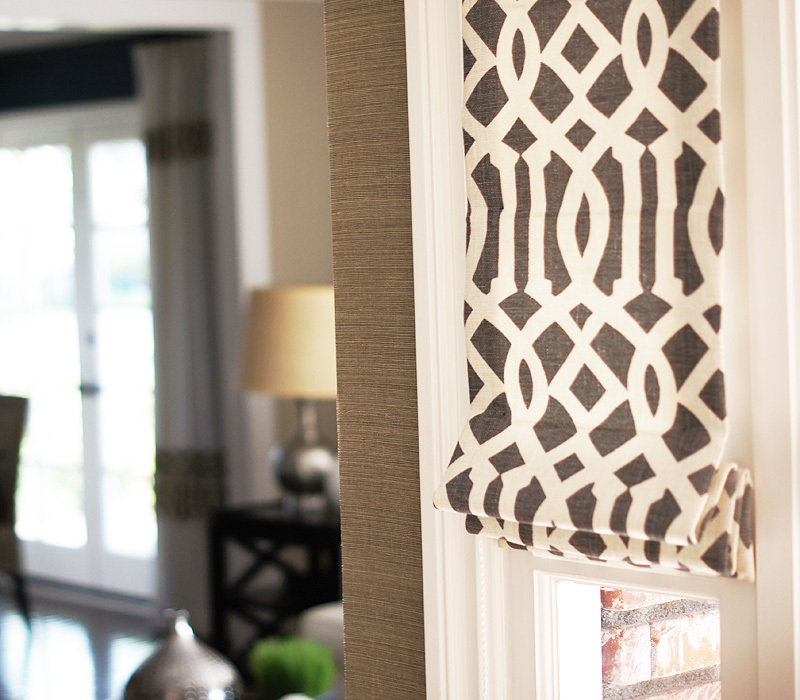 The Roman Shade fabric really stands out and makes the whole look work. At DrapeStyle, our Designers can help you maximize your budget and get creative with your drapery. The internet and eCommerce have literally transformed the way we buy everything today. Who would have considered buy appliances, clothing, even food through a website just ten short years ago. Today we have such amazing resources at our finger-tips. Sites like Houzz and Pinterest give us the ability to drool over images of things we want, need and most of the time can’t afford. The Custom Drapery Industry, no exception. For good or for bad, the days of heading downtown to the local drapery store are over. Most of the main street storefronts have either migrated to the web or are about too. As a Consumer we now have more information, more options and better resources than ever before. We’ve been in the Custom Drapery Business for a very long time and we thought we would give you as much information as we possibly can. Even if you end up buying your draperies elsewhere, we hope you appreciate the information. Chapter I: My Sister Bought her Drapes from Restoration Hardware. Yes. It is true, and now the whole world will know. My Wife and I own a Custom Drapery Company and my little sister bought her drapes from Restoration Hardware. Now, a little background. We are from New Jersey. Working Class New Jersey where most of my Family still lives. My Sister and her husband bought a new home in a brand new upscale community in southwest New Jersey. They love it. Big beautiful new homes averaging over 4000 square feet each. These are the McMansions that became popular in the late 90’s and early 2000’s. Really huge tall windows with great views and vaulted ceilings. Stainless steel kitchens with two dishwashers. So Lori buys this new home and all of her new friends in the neighborhood are hiring Interior Designers / Decorators to help them all deck the places out. Lori calls me and asks what I think and I tell her to go ahead and hire this Decorator that she was referred too. You know, got to keep up with the Jones’. Well, a few months later and I get the call. “Ron”, her Decorator has suggested that she buy new drapes at Restoration Hardware. He does it all of the time she tells me. Now, they wont be wide enough but Ron has a resource where they are going to buy two pair of drapes and then sew them together. Oh boy. Flash forward 2 years. Now, my Parents buy a house about two miles away from my Sister, also in a new development. This one though, no McMansions. These homes are, well, single level. No stairs. Wide hallways and a lot of hand-rails. You got me, right? But these houses are nice, I mean, really nice. And, Like Lori, all of these Ladies are hiring Decorators too! So now I get the call from my Mother and I brace myself. If she tells me that she is buying Restoration Hardware Drapes I am going to have a brain freeze. Turns out that her Decorator suggested that you buy her drapes from a place called DrapeStyle! An “Online Company” she says. My Mom could not have been more tickled. Sometimes “kids” just have to learn for themselves. Here is the real deal. The Thai Silk Drapes from Restoration Hardware were really not all “that bad”, but they weren’t DrapeStyle. They were lined but not interlined, the fabrics were thin. The hems were short and cheap. They just weren’t “custom”. And the reality is that they didn’t cost much less than DrapeStyle and by the time she paid the tailor to sew the two panels together, they really were about the same price as DrapeStyle 100% Custom. Lori spent a lot of time and a lot of money on those drapes and now we are making her new ones. She gets the “Family Discount” but she would have been much happier if she would have just ordered from DrapeStyle to begin with. We love the whole “Hollywood Regency” look. You can really incorporate some of the design elements into a wide variety of decor. The Greek Key is a timeless design that will lend itself to almost any interior. 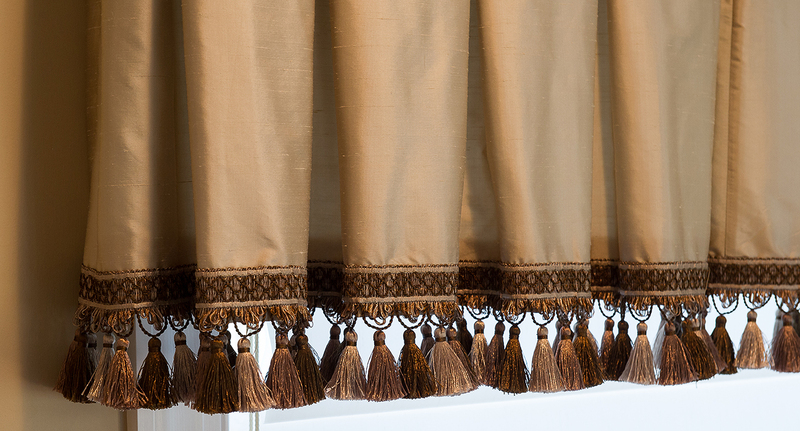 We make these gorgeous custom drapes in your choice of solid silk fabric and apply the Greek Key Trim to the leading edge. Consider stepping out of your comfort zone and choosing a dramatic and bold color. 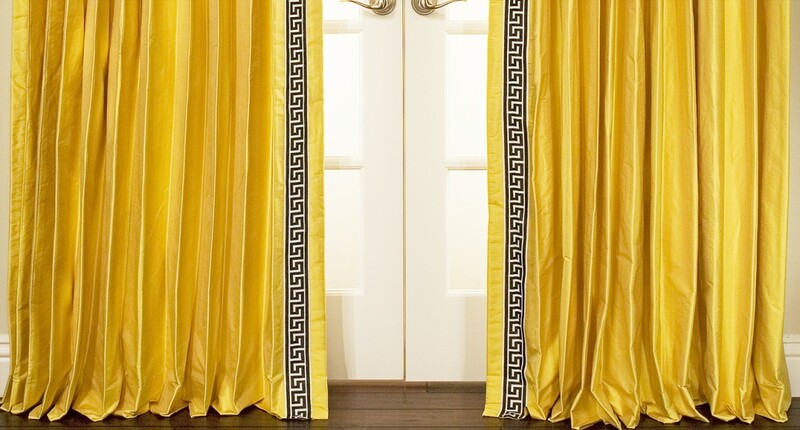 We love the choice of yellow silk on this drape with the bold black Greek Key Trim. 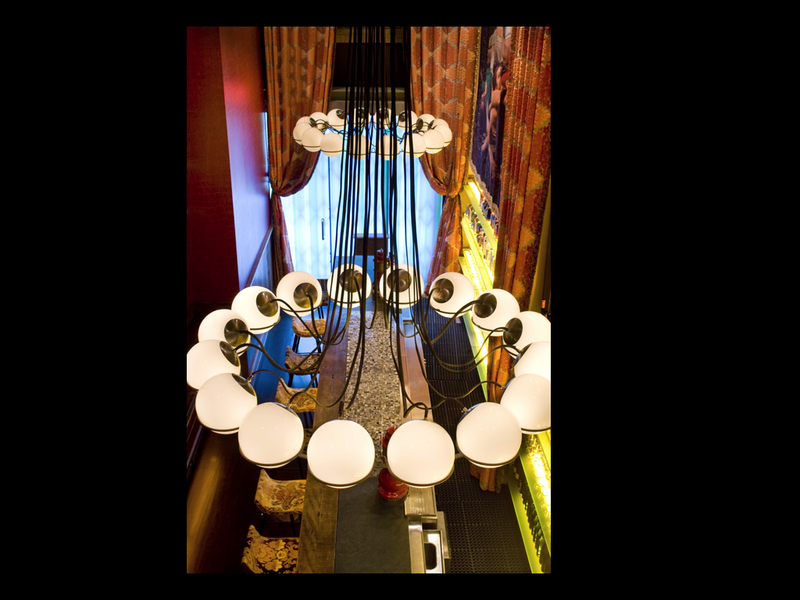 Experiment a little and create a truly unique design for your home. If you need some design advice, please call one of our Designers who will be happy to make suggestions and help you create an amazing focal point for your room.